Learn about the eleven species of stingless bees found in Australia based on the findings of the Australian Native Bee Research Centre, including step-by-step identification charts and detailed descriptions.. 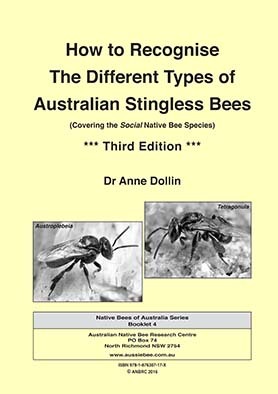 Note: This booklet covers our 11 species of social stingless bees only (Tetragonula and Austroplebeia). It does not discuss in detail our solitary species such as blue banded bees or leafcutter bees. For details on Australia's 1,600 solitary bee species see Booklet 1 and our Native Bee Field Guide. Price: $Aust 10.00 plus postage & handling. or buy the whole set of six booklets for $45 (save $9) plus postage and handling.